Enjoy some affordable accommodations in a neat 1 & 1/2 story redecorated Sudendorf complex townhouse located in Schuss Village at Shanty Creek Resort...the very popular golf and ski resort located near Bellaire, Michigan. The expansive Schuss ski slopes are under three minutes away by car or resort bus. A private pool for the complex is located directly across from the front of the unit, while a sliding door to the rear of the unit leads to a large deck overlooking the dense woods. If cooking is in your plans, utilize the Weber grill located there. The cozy, memorabilia filled unit has one bedroom with a queen bed, a loft with two twin beds, and a pull out double in the living area. There is a full bath on the main level and a half bath in the loft. The unit can sleep 6 comfortably, and is perfect for two couples or a family. A fully stocked kitchen, DVD, and Stereo are there for your use and there's lots of firewood available for the living area fire place. Amenities:: A fully stocked Kitchen, Microwave, TV, DVD, Stereo / CD / Cassette player, wood burning fireplace (wood furnished) and a Weber grill on the large wood deck.....Free WI-FI is available. Summer & Winter Activities:: ...In the summer, enjoy the pool located just steps from the townhouse (open from Memorial Day to Labor Day), golfing at the four high quality resort courses....Cedar River(Weiskopf), The Legend(Palmer), Schuss Mountain Course, and Summit Course... or others nearby, hiking and biking. You could also do a little fishing, boating or other water sports in Torch Lake or nearby Lake Bellaire, or take a 2-4 hr. Jordan River Canoe Trip. ...In the Winter, enjoy the large Schuss Village ski area or the ski area at nearby Summit Village..including night skiing. Summit Village also has a great tubing facility. There are also many groomed cross-country trails. 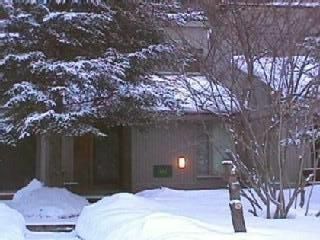 General Info:: Shanty Creek Resort is comprised of Schuss Village, Summit Village, and Cedar River Village. all of which are within 2 or 3 miles of each other. There is very good signage to assist one in getting from one village to the other. There is nothing prettier than the October color changes in the wooded areas. There are programs available, in both the summer and ski seasons, for young children. Child care and babysitting services are also available through the resort. Parking is available in front of the townhouse, about 70 feet away. A full kitchen is located in the unit. Schuss Village of Shanty Creek Resort is located just off of M-88, between Bellaire and Mancelona, Michigan. From here, it's about an hour's drive southwest to Traverse City, and its nearby Leelanau Peninsula, which holds the breath-taking Sleeping Bear Dunes. You could also visit the many wineries or the casino located there. Head northward from Schuss, about an hour, to the unique towns of Charlevoix or Petoskey... or go even a little further and visit Mackinac Island for a day. Rent a pontoon boat and cruise world renowned Torch Lake... only a 20-minute drive away...or canoe the nearby Jordan River. Play one of the many beautiful golf courses in the area or do some fishing in the numerous rivers and lakes you'll find close by. Take a walk in the woods, go cross-country skiing or just relax at the pool with a book in the summer. There's so much to do! !